Doug Haining is one of those rare people who had the talent to carry his passion for music from grade school into a career. After winning awards at St. Louis Park High School for playing the clarinet, the 1975 graduate studied classical clarinet at St. Olaf College in Northfield, Minnesota. He is equally proficient on the saxophone. He has performed professionally since 1974, backing national artists such as Steve Allen, Don Rickles, Bob Hope, and others, and Broadway shows such as West Side Story, Cats, A Chorus Line and many others. “Last Man Swinging,” released in 2011 by the Doug Haining Quintet. 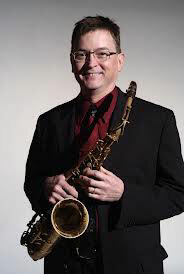 He writes arrangements and compositions and has performed at many local venues, jazz festivals, and regional performing venues outside the metro area. He also teaches privately and co-leads the Edina High School Jazz Ensemble I. He has two children, Trevor and Preston, both of whom are pursuing music careers. Growing up, Doug lived at 39th and Lynn Ave. in St. Louis Park and shopped at the Family Foods Store.